Browsing articles tagged with " Krian Scout"
376765 is not a code as in Dan Brown’s fiction <Digital Fortress> nor a magical number. 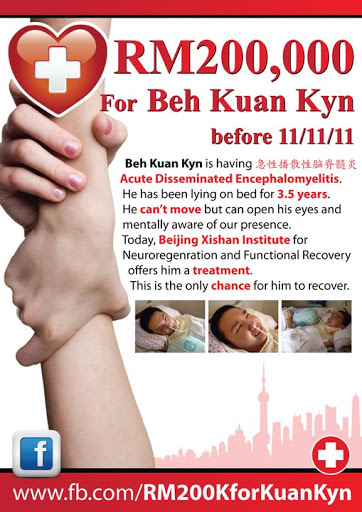 It is RM 376,765 (120,000 USD) – the total amount raised for Beh Kuan Kyn Medical Fund in less than 2 months. I am writing this post to tell a story. 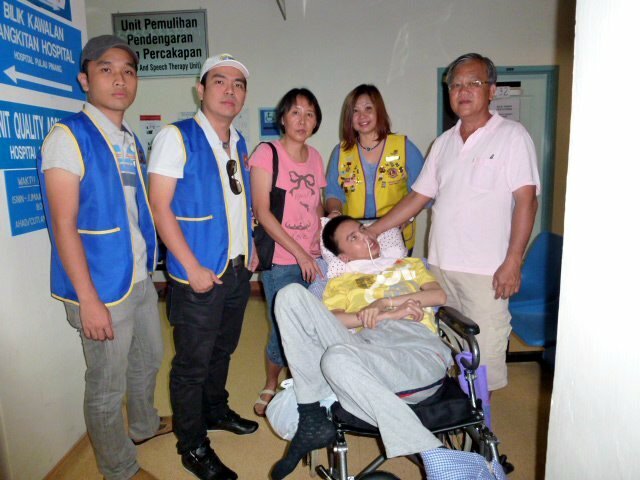 It is an inspiring story of how communities from Parit Buntar, different states in Malaysia and also overseas coming together as one to help Beh Kuan Kyn, a King Scout who suffers from Acute Disseminated Encephalomyelitis. As I was gathering information for this post; every word of encouragement, motivational pictures, donations and spread of words have touched my heart deeply. Now, I truly believe there is love in this community. 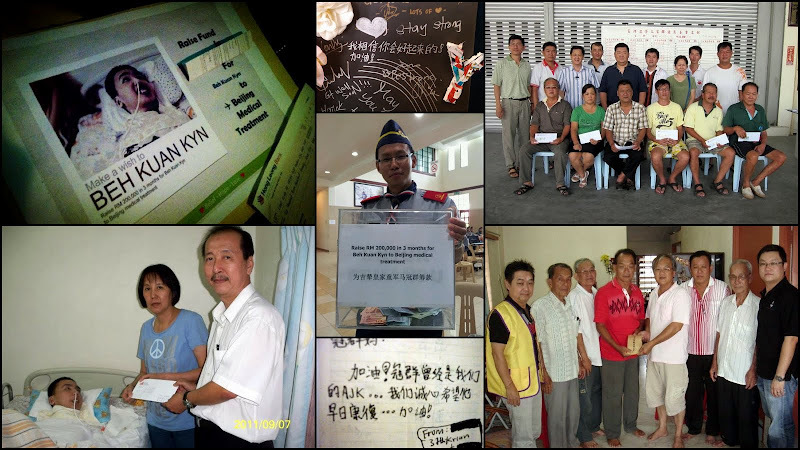 If you have made a contribution regardless of amount to Beh Kuan Kyn; started a campaign at your college, company, organization; or just shared at your Facebook wall – You are already saving a life. It is a noble act of love, self-giving and an up most respect towards a human life. 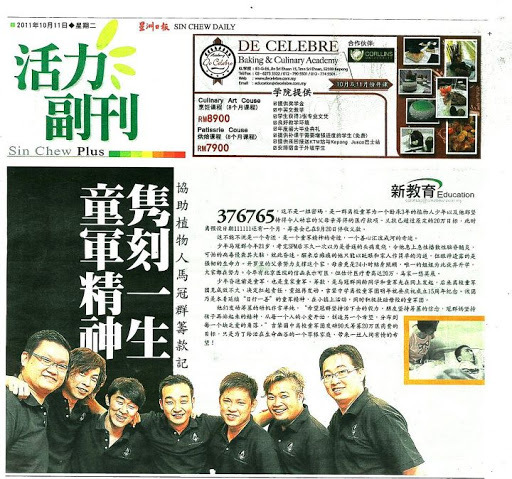 On behalf of Beh Kuan Kyn Medical Fundraising Committee, I salute and thank for your help. It all started with a wish. 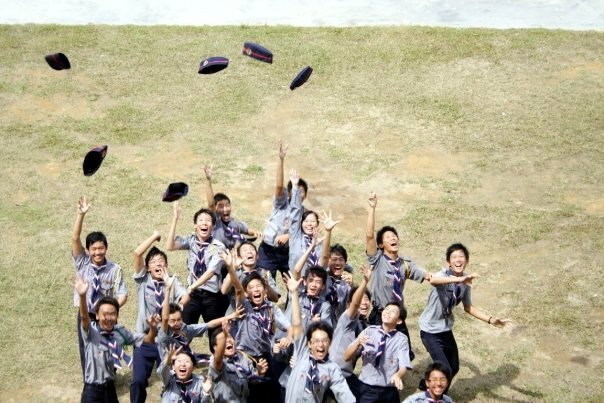 Kuan Kyn is in our batch – we had great fun together especially in scouting life. On Aug 4, Wei Jien, Dalton, Ilman and I paid a visit to Kuan Kyn’s house. To be honest, it’s been almost a year since we last visited him. Zheng Cong used to be the most enthusiastic one and always initiated the visit, but this time he was away from hometown. Her mum welcomed us warmly as it is always good to have friends to cheer Kuan Kyn up. We went into Kuan Kyn’s room and talked to him. He can’t really move but is mentally aware and active. He winked to respond us. From his cheek, we noticed he has grown some weight and definitely looks healthier than last year. Meanwhile, we had a conversation with his mum – an individual whom I respect a lot. She has done her very best to take good care of Kuan Kyn, and never give up on her only son even facing tremendous obstacles. She told us appointment with a Beijing hospital was even made few months ago and showed us the official letter. 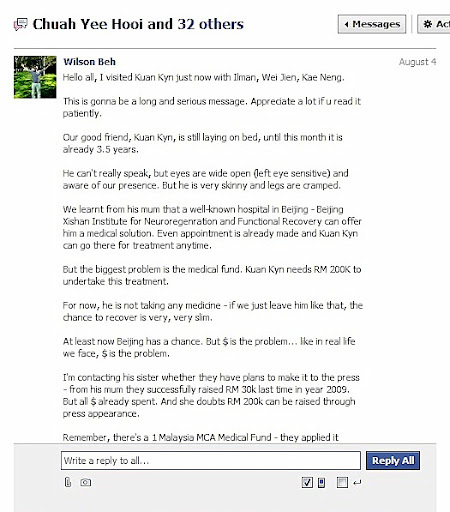 Before that, Kuan Kyn’s MRI scan and medical reports were already sent to Beijing. The only matter is the exorbitant medical fee, which costs at least RM 200,000 just for operation and flight ticket, excluded further treatments and cost to support post-treatments. According to experts, it will reach a staggering cost of RM 350,000 or even more. True indeed. 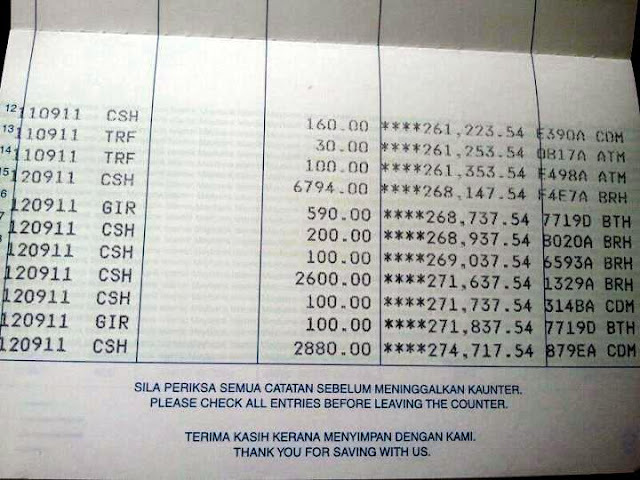 It is not easy for a middle class family to spend RM 300,000 just on medical expenditure, not to mention to a family which used all their saving over the past 3.5 years for Kuan Kyn’s medicals. On the way back, I discussed with Wei Jien, Dalton and Ilman. On the same night, I sent out this Facebook message to my close 33 hometown friends. From then, things were not the same anymore. The message received overwhelming responses from all. Xin Kun, Chu Meng, Kok Lim, Chloe and many suggested different ideas. Wah Ching kicked start by forming a Facebook group Kuan Kyn – You are not alone which later gathered 300 strong supporters for this cause. This was the picture we took during our first meeting. Kuan Kyn’s sister was present too. As all hometown friends progressed towards different paths of life, we had little time together.Some of us have not met each other since graduation 4 years ago; but because of Kuan Kyn, all of us are closely tied again. 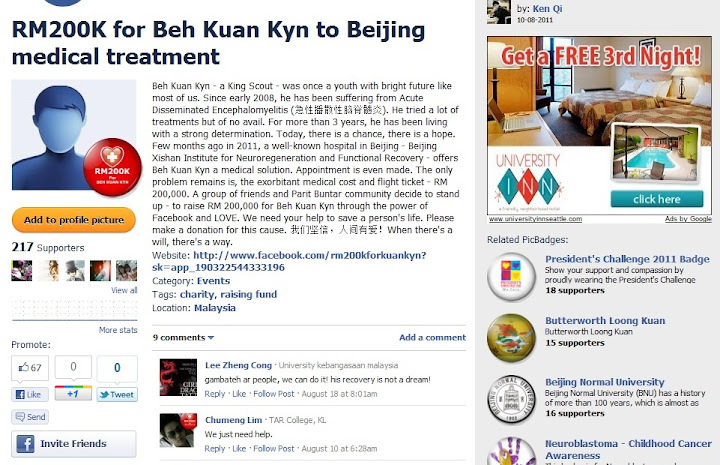 We formed Beh Kuan Kyn Medical Fundraising Committee and also set up this Facebook page. The Facebook page reached 2,000 likes in less than 48 hours. We brainstormed on different alternatives – to raise RM 200,000 at the soonest of convenience. A timeline was set: before 11.11.11, the amount must be raised. Frankly speaking, we were not quite sure whether this huge amount of money can be raised. It is not RM 20,000. But ingrained in our spirit we knew it is possible and we must do it professionally, transparently to win credibility from the society. 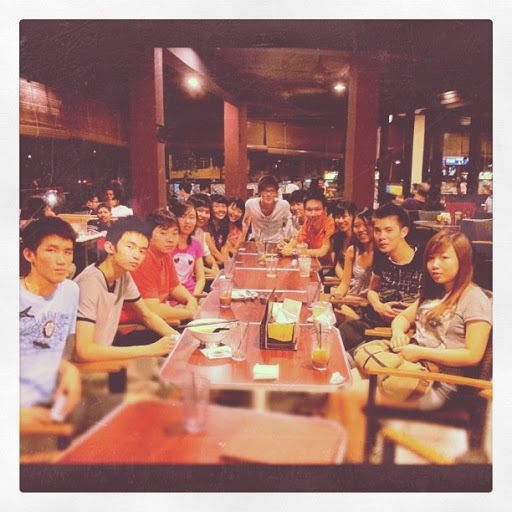 The next day, we met up with Krian X Scout and also Luvotion team. Krian X Scout – From left Soon Kiang, Geoffrey, Wei Jien (Our batch Parit Buntar Agent, haha, u will understand if you’re 37th Krian Scout), Khok Zhen, Ken Qi, David Thian, Zhan Feng. They are many years elder than us and all having their own career and family. However, they are the one who spend the most time, standing at the forefront and do all the sweat and toil – to help their junior scout Beh Kuan Kyn. During the first 2 weeks, we had meeting relentlessly almost every night. I would say, without them, this medical fund will not be raised in such a short time. We treat this as a project by undertaking professional methods. The secretary team – Jia Hui, Hui Di, Heng How worked closely with Kuan Kyn’s family to gather all official letters, medical reports and also updating meeting outcome to the entire team. Luvotion team led by scout senior – David Thian started a video campaign for Beh Kuan Kyn. Friends from SMJK Krian all turned out at the video shooting day to support Kuan Kyn through actions. There are many other friends who are raising fund from family and friends. 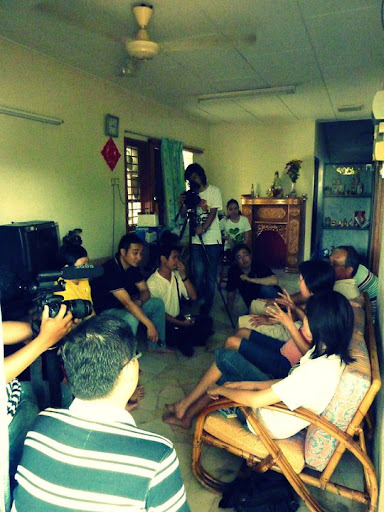 The team also went to Kuan Kyn’s house to record a video – and this video turns out to be the most important starting point for public awareness. 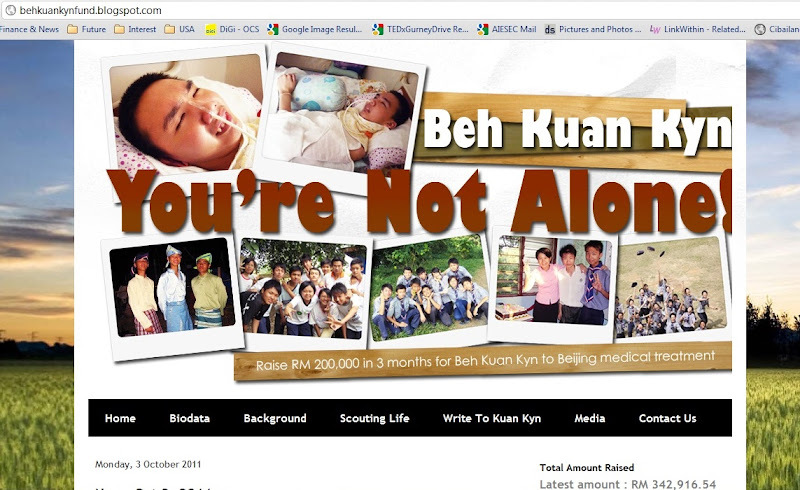 Raise 200k for beh kuan kyn on Vimeo. PicBadge was created by Ken Qi and more than 200 wearing this badge to support the cause. An official website was set up, too, to publish important background information of Beh Kuan Kyn. 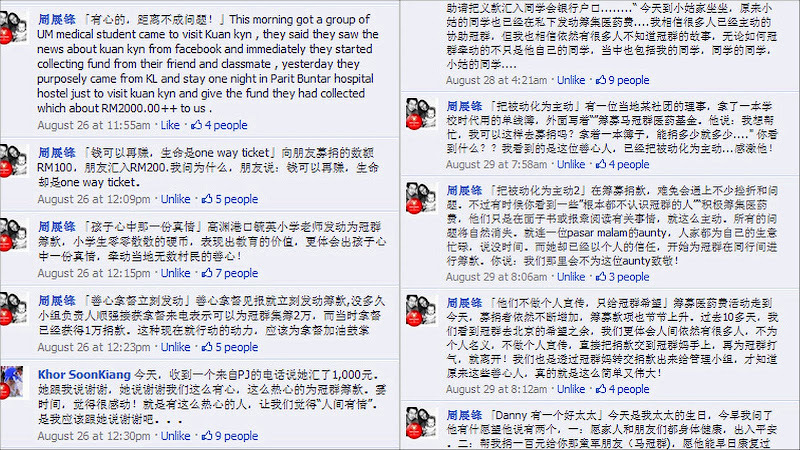 It is especially touching to read articles by Kuan Kyn’s friends at ”Write To Kuan Kyn” section. When this campaign was first launched, we had some difficult time to come out with a proper bank account. This is due to organization we approached did not want to take risk. Disappointed, we turned to another group. While our bank account was in process, the donation part had already started aggressively. In less than a week even without bank account, we had collected RM 16,492 from Parit Buntar community who are so kindhearted to help. 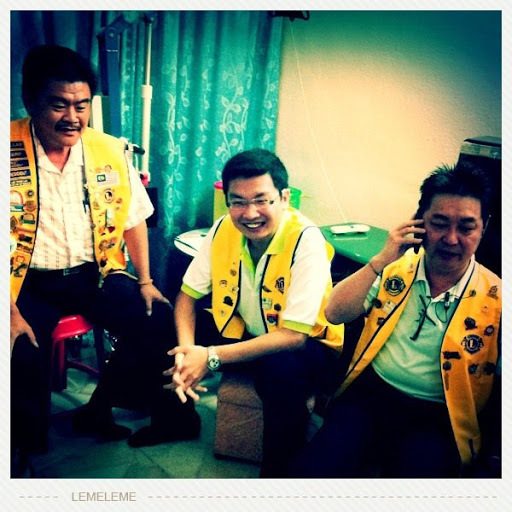 They are mostly friends to the committee members, mutual friends and also scout members of different generations. A lot of people telling us:” I will donate this amount. Just let me know when the bank account is ready. I will Maybank2u“. 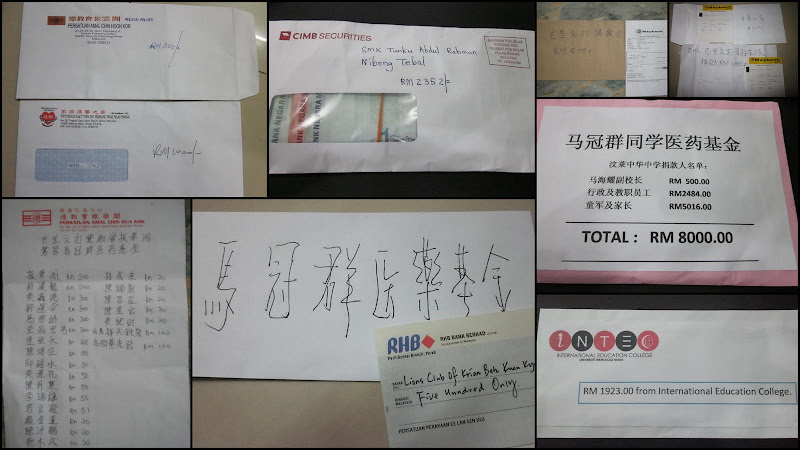 Another friend of mine from Simpang Empat passed me a RM 1,000 ang pao and said:” This is from my mum to help Kuan Kyn. We don’t know him but just wanna help“. I did not receive but asked her to deposit when the bank account is ready. This is the kind of force that keep us going and worked even harder. 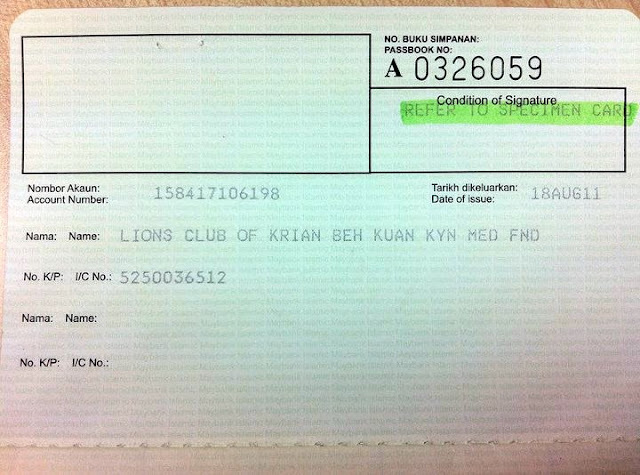 Finally, thanks to Lion Club of Krian district, the bank account is ready by August 18, 2011. The transparency of bank account is the most imperative above all. There are so many deceptions nowadays and we can’t afford to lose the faith from public. We publish every single information of the bank account in our website, Facebook and also through the presses. To make it even more reliable, official receipt is issued on every 15th upon request. Once the bank account was ready and coupled with media highlights, the real momentum started. I still can recall vividly on Monday, just 3 days after the bank account was activated; Soon Kiang phoned me while I was on the way to airport:” The donation collected in bank is over RM 16,000 now“. At that very moment, I was saying to myself “Kuan Kyn, this time you really have hope!“. In just about 2 weeks time, the amount raised had exceeded RM 200,000. Contribution from everyone counts – from as little as RM 5 to as much as RM 5,000 and more. It is a sincere wish from you so this young man can stand up once again. Damansara Metro N.C. Lions Club & LCKL Mega City are among the first few organizations which stand by closely with us in this cause. They came all the way from KL to Penang and started their own campaign through video. Donations from different organization, colleges, companies, individuals and many who remained anonymous. Throughout the process, we really see the positive side of this society. A story after another on encounters with kindhearted people around Malaysia and not to mention Singapore and Brunei. Most of them they don’t even know Beh Kuan Kyn personally. They have nothing to ‘gain’ by doing this. No tax rebate. No fame. Nothing. It is purely a good deed. 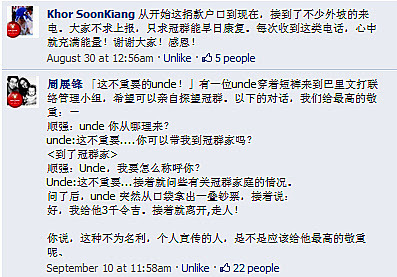 After that, the anonymous uncle asked a lot of questions regarding Kuan Kyn’s conditions. Then, he took a pile of notes from pocket and told Soon Kiang. Immediately after, the anonymous uncle left and we never have the chance to know who is he. Shall we not salute this person who does not want any fame but pure kindness? 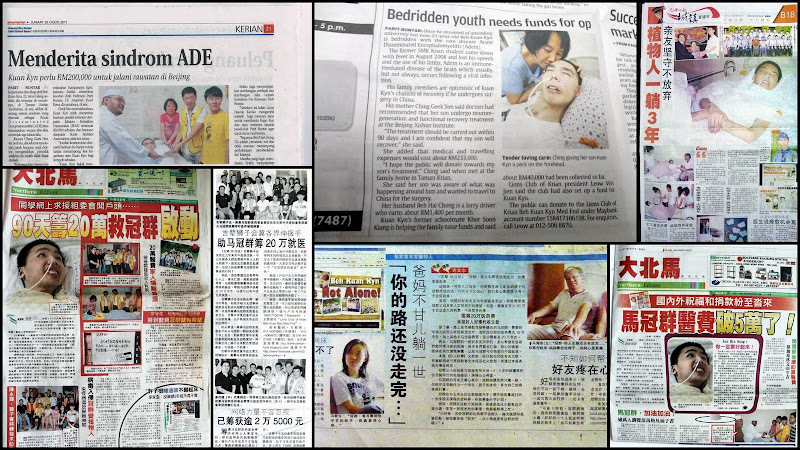 All the major newspapers such as Kwong Wah, Sin Chew, Nan Yang published Beh Kuan Kyn Medical Fundraising news and propelled this into a national issue. 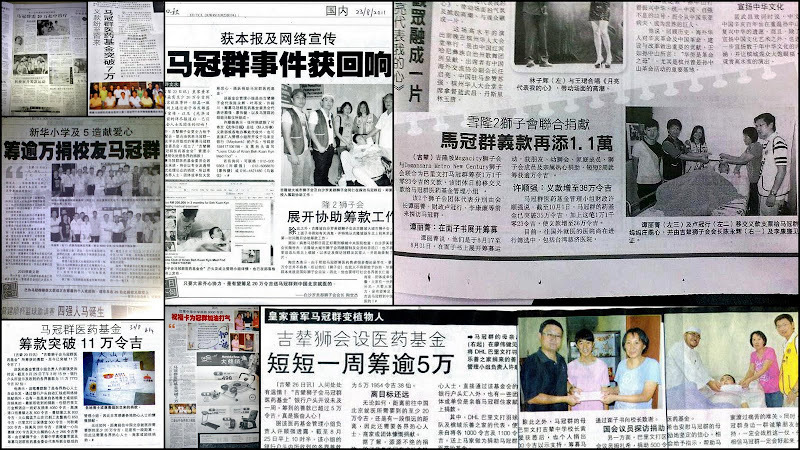 The Star and Sinar Harian also covered on this issue and reached out to non-Mandarin speaking communities. Deputy Minister from MCA and Member of Parliament from PAS also visited Kuan Kyn and pledged to help. And we witnessed the real 1 Malaysia, too. Persatuan Siswa/i Islam Perubatan Universiti Malaya (PSIPUM) – University Malaya Islamic Medical Organization passed the fund raised to Kuan Kyn’s mum all the way from Kuala Lumpur. They didn’t know Kuan Kyn, either. They got to know this news from Facebook and started their fundraising campaign. This is just an example of many self-initiated campaigns national-wide. 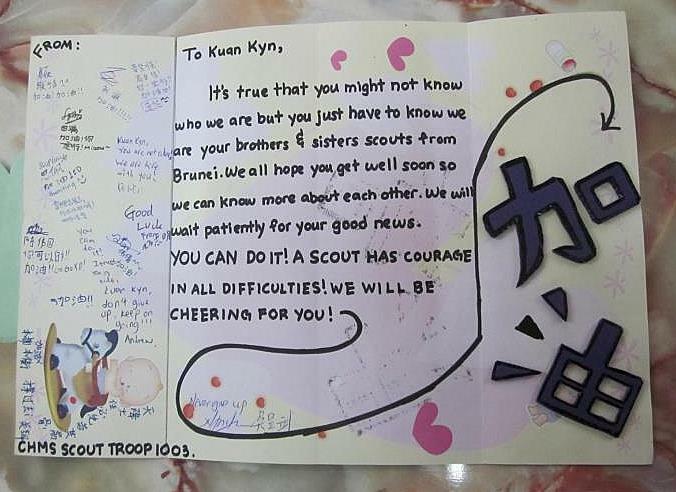 This is a card designed by fellow scouts from Chung Hwa Middle School, Brunei. I found the sentences simply inspiring. 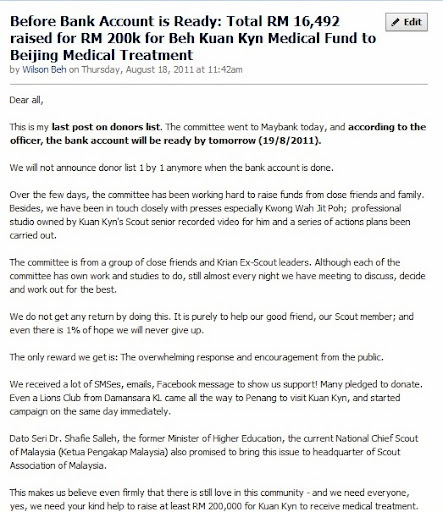 More than a thousand people contributed to this medical fund and yes, most of them do not know Kuan Kyn personally just like the brother and sister scouts from Brunei. But they know – his spirit and courage can overcome all these difficulties. They support and stand by him through actions. Kuan Kyn has never given up on himself. Same goes to his family. Do you think it is easy for a family to seek for help publicly? Kuan Kyn’s mum has to wake up many times in the middle of night to make sure he is well. His sister did not finish her ACCA papers due to this incident. However, his family is strong in facing all these ordeals and we should keep supporting them. Today, the committee is working together with Kuan Kyn’s family on hospital matter. This is the most important decision to make and details will be updated through Facebook from time to time. 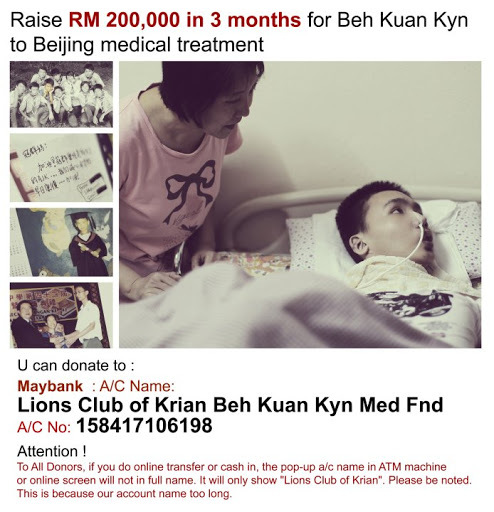 Beh Kuan Kyn Medical Fundraising is a real story of community love. Thank you for being in this journey which has just started. 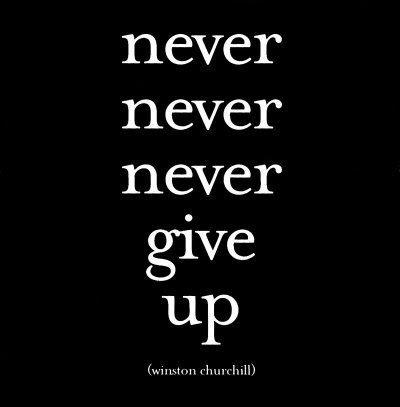 There are challenges ahead but we can surely overcome through teamwork, faith and love. Let’s us keep the dream alive, keep supporting Kuan Kyn. Remember, when there is great love, there are always miracles.